Join us in the Call of the Wild Food Court and enjoy for a variety of menu choices in a spacious dining area overlooking the Zoo’s main lake. The Call of the Wild is open year round for a snack, lunch or a tasty treat. Aldo’s Burgers: Sear. Sizzle. Savor. 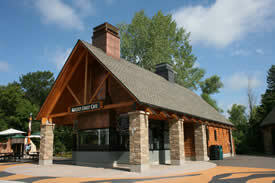 Those are the words that will welcome burger lovers at the Minnesota Zoo to our gourmet burger outlet. 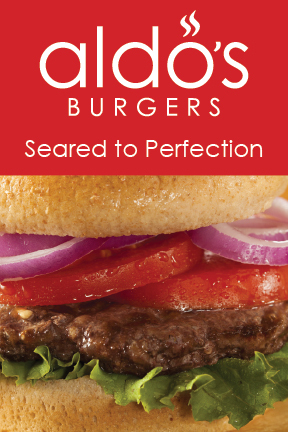 All beef hand-patted burgers are seared to perfection and seasoned with our signature Aldo’s blend. While the burgers steal the show, Aldo’s also offers chicken sandwiches, a black bean vegetarian burger, veggie Caprese or Mediterranean sandwich, Nathan’s Famous Hot Dog, waffle fries, cheese curds, and choice of Kid’s Meals-cheeseburger, hot dog or chicken strips served with Mandarin oranges or carrots or fries, and milk or juice, or soda. Mix’d Greens: Looking for a fresh salad? Try one of our Specialty Salads including Asian Chicken, Caesar, Cobb, Greek or Southwestern. We also feature a Spinach and Kale Salad, Insalata Caprese or Vegan Boost brimming with spring mix, broccoli, carrots, green apples, edamame and topped with balsamic vinaigrette. Still haven’t found the perfect salad on our menu? Create your own salad from our many fresh ingredients and make it your own! Mix’d Greens menu provides gluten free, vegetarian and vegan options as well as fresh greens grown in our own herb cultivator and served fresh. Pranzos: Get a freshly made pizza. Offers traditional cheese, pepperoni, sausage and specialty pizzas. All pizzas include naan crust and mozzarella cheese. Our specialty Grazie includes sausage, pizza sauce, caramelized onions, and sliced banana peppers. We feature a Bruschetta pizza with sliced tomatoes, garlic aioli, balsamic glaze, and fresh basil. The Spicy Pacino is made with pizza sauce, spinach leaves, diced capicola, julienne green peppers, diced green olives, and garlic aioli. Our Sweet Chili Chicken has sweet chili sauce, julienne chicken, julienne red peppers, chopped green onions, and cilantro spring. You also have the option to build your own! Erbert & Gerbert’s: We’re serious about delivering total flavor satisfaction so we’re tempting taste buds in a whole new way. Fresh baked bread daily, meats and cheeses that are hand-sliced for freshness, and chef-inspired soup and sandwich recipes. Whether its peppadew mustard and cherrywood smoked bacon or pesto infused mayo and sun-dried tomatoes, you can expect more flavor to savor. The Penguin Café is conveniently located adjacent to the new 3M Penguins of the African Coast exhibit near the Zoo’s main entrance. Visitors can enjoy their favorite latte, espresso or specialty coffee drinks served hot or cold, as well as blended drinks. Penguin Café also features gourmet popcorn, Flavor Burst ice cream and a variety of snacks and pastries. Penguin Café is open daily during Zoo hours. This gourmet coffee and snack shop is located on the Tropic/Minnesota Trail Plaza across from the Target Learning Theatre. WILD JAVA proudly serves Caribou coffee, latte coolers or iced chai, plus baked fresh muffins or pastry, pretzel, fruit and chips. WILD JAVA is open seasonally during Zoo hours where you can enjoy your favorite “cup of joe.” or specialty coffee drinks served hot or cold. Stop by the Grizzly Coast Café for a taste of Russia. The Café is located on the Central Plaza and features ethnically diverse dishes such as Russian Rueben or Pike Sandwich or Russian Cobb Salad, as well as visitors’ favorites including cheeseburgers, brat, soft service ice cream and beverages. Grizzly Coast Café is open seasonally. Located in the farmhouse at the Wells Fargo Family Farm, the Country Fare Kitchen offers fresh made-to-order sandwiches, fresh sweet corn, kid’s meals as well as a selection of cold beverages, Caribou coffee, hand dipped ice cream, chocolate shakes and root beer floats. Country Fare Kitchen is open seasonally. World Tacos combines the popularity of tacos with the unique blends and flavors of Mexico. Your choice of flour tortilla, spice rubbed beef or chicken tacos, burrito bowl, nachos, taco salads, chips and guacamole, kids tacos, and a variety of beverages. Located next to the Tiger Lair exhibit and across from the Weesner Family Amphitheater. Ice Cream Carts Located throughout the zoo grounds, our carts offer beverages or a variety of ice cream novelties for those warm summer days. Looking for a vegetarian meal or a reduced-fat entrée? No problem. The menu at The Call of the Wild features Create-A-Balance offering a variety of choices and information to fit your lifestyle and dietary needs. Also Healthy Choices menu options substitutes include fruit or baked chips. Lancer Hospitality is proud to offer options prepared without gluten on many of our menus. Because we operate a from-scratch kitchen, we cannot guarantee that gluten-friendly items have not come in contact with items containing gluten. Lancer strives to accommodate all of our guests’ dietary needs. Should you have questions, any of the chefs would be happy to speak with you. Minnesota Zoo and Lancer Hospitality are working together to reduce our impact on the environment. We work with distributors and vendors to source products locally, recycle paper, plastic and metal, and use recycled or compostable products to help reduce our carbon footprint. *Please note that the Minnesota Zoo does not offer disposable straws and lids at any food location due to animal health concerns. Reusable larger souvenir cups for sale have lids and straws. If a straw is needed, you may bring your own, but please dispose of it properly or take it home so it does not end up in an animal habitat.